Raúl de Nieves with his installation, When I Look into Your Eyes I See the Sun, 2018. Photo by BFA.com. “I’m really trying to become friends with my fears,” Raúl de Nieves says, a twinge of exasperation laces his voice. But who would blame him for being a bit tired: Since his stunning stained-glass and sculpture installation during the Whitney Biennal made a colorful splash in 2017, de Nieves has been increasingly in demand, and his latest project is the culmination of months of research and production. When I Look into Your Eyes I See the Sun (2018) channels the dread the artist is seeking to befriend through a fantastical journey of memory and myth. A site-specific installation produced in partnership with Bulgari and the Art Production Fund during Art Basel Miami Beach, When I Look into Your Eyes I See the Sun is an ode to the beauty of transformation and the mirage of fear. A bejeweled carousel with glittering beasts spiraling in the opulent entrance of the Faena Hotel Miami Beach, de Nieves’ public sculpture recalls the joyful simplicity of childhood reminding us that transformation often accompanies the release of fear. To create the work, de Nieves and Art Production Fund executive director Casey Fremont traveled to Rome and immersed themselves in its old-world opulence. Much of that sojourn wound up in de Nieves’ carousel. The carousel floor, for example, was inspired by the mosaics of the Caracalla Baths that Bulgari recently restored, while eight beaded horses, a pair of furry imaginary beasts and a severed snake draw on the mythological Roman tale of St. George and the Dragon. 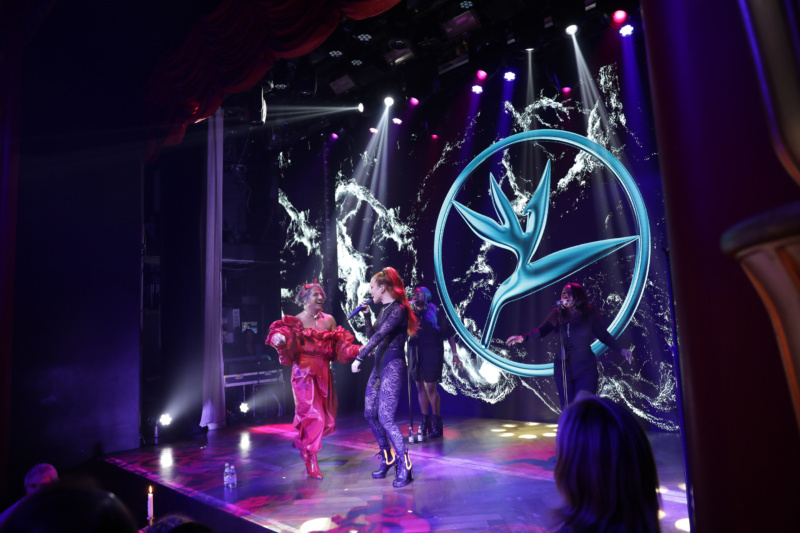 Jess Glynne performing with Raul de Nieves at the celebratory dinner. Photo by BFA.com. To celebrate the work, Bulgari and Art Production Fund hosted a gilded dinner at the Faena Miami Beach on Tuesday night. De Nieves played on the evening’s transformative theme, in a silky ruby red pantsuit with ruched sleeves by Vaquera. Sparkling in a Bulgari Serpenti collar and golden cuff, de Nieves demonstrated no visible fright when he joined Jess Glynne, who surprised guests with a special performance, on the stage; dancing furiously to the melody with childlike abandon.